Hasbro's toylines seem to have a real problem with "phantom" series: series that are solicited for the end of a line, but never show up because nobody but online retailers wants to order them. It's been particularly bad with the "Reveal the Shield" portion of the adjectiveless "Transformers" line that followed the Revenge of the Fallen toys - retailers didn't want to buy Transformers 2 cases when Transformers 3 toys were on the way. One of the casualties was Legends Megatron. Fans had really been looking forward to him since he was revealed, because this was the first G1-styled Megatron we've had since actual G1. 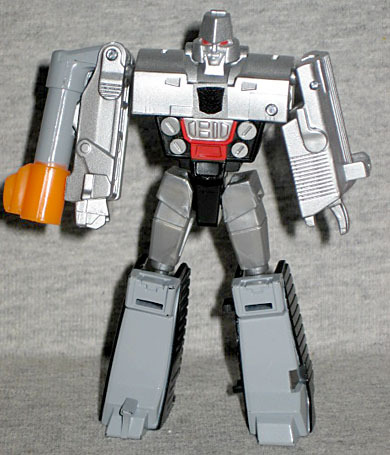 In robot mode, Megatron is just over 3" tall, and is the silver robot you remember fighting Optimus Prime back in the '80s. Articulation is as simple as you'd expect from a toy this size: he has balljoints at the shoulders, hips and knees, and all those only because they're needed to change him. Naturally, he turns into a gun. Not into a space gun, or a Nerf gun; just a gun. A tiny, tiny gun. It's a variation on the original's Walther P38 altmode, just without any details that are so close to the real thing that they'd have to pay to use them. Despite the fact that the gun is way, way too small to ever be mistaken for the real thing - 3½" long and 2⅛" tall - safety regulations dictate that the tip of the barrel has to be orange. It's not just a plug, like Masterpiece Megatron had; the entire barrel is cast in orange plastic, then part of it is painted grey. Ridiculous, but an easy fix. There's one more feature on Megatron that's spectacularly cool. If you look at the gun's handle, you'll see two tabs on one side, and a notch on the other. There's nothing really special about them: they look like the kind of design artifacts that Transformers have all the time. But they actually serve a purpose, this time. 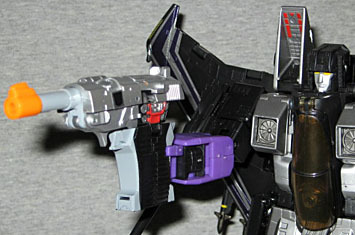 You know how Megatron would often be wielded by other Decepticons when he was in gun mode? 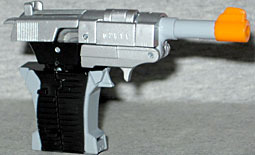 The embellishments on the handle are sized perfectly to allow Masterpiece Starscream to hold the gun in his right hand. Remember when Poe just about wet himself because two figures released a few months apart in DC Universe Classics could trade accessories? These are toys separated by six years, and they still fit together like hand and glove. Or hand and gun, as the case might be. As part of the phantom series, Megatron was incredibly hard to find, and thus rather expensive - and then he was found at various discount stores, including Borders, which has slashed prices as they go into bankruptcy. My Megatron came from BotCon, but if you act fast you should be able to pick him up for less than $5. And at that price, he's plenty worth it! This entry was posted in blog exclusive review, Hasbro and tagged Megatron, Transformers. Bookmark the permalink. Yo, Affleck was the bomb in "Phantoms". I guess its cool that MP Starscream can hold this guy but I think I'd just have him weild the gun that came with MP Prime. Fiddly as it was I think I'll stick with the WST version. Yeah, I understand. The orange safety tip kind of bothers me but it looks like a better mold overall. But I really wish either one had come with the stock and extended barrel-WST has the scope/cannon, but it's not quite right without the extra pieces. Have the WST version of Megs, didn't like it. I like this one much more, more accurate to most depictions of Megatron, much more posable, and goes great back to back with my Legends G2 Megatron.